Several years ago, while rummaging through an antique store, I found a magnificent Lone Ranger pin, circa 1950. About 2" inches in diameter, the light blue pin pictured the white-hatted Masked Man on his equally white steed, Silver, galloping directly ahead hot on the trail of desperados, red scarf trailing in the breeze. I snapped it up, immediately attached it to my jean jacket, and set about rediscovering "Who was that masked man? ""—as characters saved by the Lone Ranger invariably asked in the closing seconds of each adventure. The Lone Ranger was, as readers with good memories already know, Texas Ranger (no first name) Reid, shot and left for dead by Butch Cavendish, leader of the bloodthirsty Cavendish Gang. Reid is rescued and nursed back to health by an old childhood friend, Tonto. Once he regained his strength, the Lone Ranger and Tonto teamed up and set out in pursuit of bad guys everywhere. As I watched the old videos and read about the Lone Ranger and the man who most famously played him, Clayton Moore, a sense of guilt slowly overwhelmed me. All of my life, I had been a Hopalong Cassidy fan, even naming one of my dogs "Hoppy." Now I confess that I'm a Lone Ranger convert. You may be surprised to learn that the Lone Ranger is not merely a part of the "thrilling days of yesteryear" as it was advertised on his radio and television programs. The Mask Man is experiencing a surge of popularity. 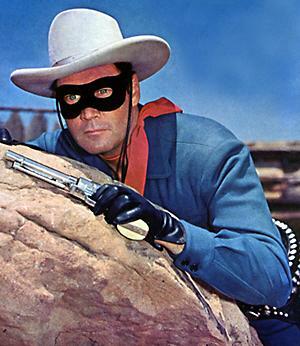 To commemorate the 75thth Anniversary of the first Lone Ranger broadcast from Detroit in 1933, Classic Media released a digitally re-mastered 13-DVD set of seasons one and two that include 78 episodes (1,900 plus minutes), three bonus chapters from a 1960 cartoon series, a classic with a starring appearance by the wonder dog Lassie, an original radio show as well as an 88-page commemorative book and reprints of rare comic books. Moore's daughter Dawn, working with the families of Roy Rogers and Gene Autry, is lobbying the United States Post Office to issue a 2009 commemorative stamp that would honor all three Western heroes and mark the 60th anniversary of the Lone Ranger's 1949 television premier. According to Moore, the westerns immortalized by her father, Rogers and Autry reflect: "Americana and patriotism … It's purely an American-based general." And in what could be the biggest boost to a resurgence of Lone Ranger enthusiasm, the Walt Disney Studio is considering a 2010 release of a full-length movie that would co-star Johnny Depp as Tonto. No leading actor has been chosen yet. Moore died ten years ago on December 27th. In his autobiography, I Was That Masked Man , Moore professed that he tried to conduct his own life according to the Lone Ranger's principles: "to live up to the standards of honesty, decency, respect, and patriotism that have defined the Lone Ranger since 1933." As we begin to put together our New Year's Resolutions, a look at the Creed that Moore developed for the Lone Ranger represents excellent 2009 goals for all of us. That a man should make the most of what gifts God gave him. That this government, of the people, by the people and for the people shall live always. In these uncertain times, the Lone Ranger represents justice, humanity and loyalty—the values on which America was founded. JOENOTE TO VDARE.COM readers: The Lone Ranger's statement that man should live by what is best for the greatest number summarizes the immigration reform movement. Immigration may be good for the individuals who come to the U.S., the lawyers who help pave their way and the people who eventually employ them. But immigration does clearly not serve the common good—it adds to America's population growth, damages our delicate ecology, drains our ever-scarce financial resources and strains to the point of breaking, our social fabric.